In the past few months, Netflix has begun rolling out HDR support for a few smartphones including the LG G6 and the Sony Xperia XZ Premium. 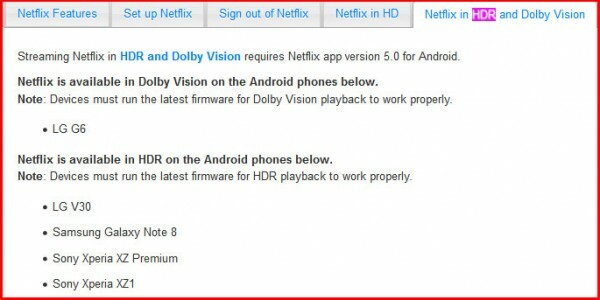 More recently, Netflix has officially gained HDR streaming support for the Sony Xperia XZ1 and the LG V30. Meanwhile, the Galaxy Note8 was the first device to officially support HDR streaming. The LG G6 at least has support for Dolby Vision, but Netflix has neither HDR nor Dolby Vision support for the Galaxy S8 and S8+ despite having HDR displays with wide-gamut output. Netflix’s HDR streaming enables a picture with a higher dynamic range than standard video. This means that you’ll see darker darks and brighter highlights for an enhanced visual experience.